I love my poppy pillow! I'm finally sharing my fabric experiments with flower pods. 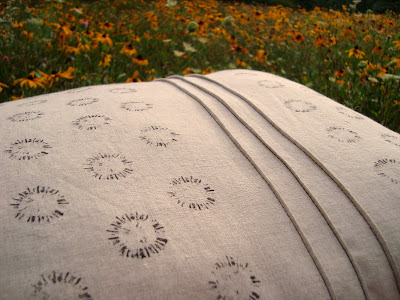 I made a linen pillow cover with black prints and pencil pleats. I think that's what those pleats are called, please correct me if I'm wrong. I just know that they were almost as fun as the poppies! This particular poppy left a little sunburst mark. It lives on my couch, but, of course, it feels equally at home in a field of wildflowers (at the barn). 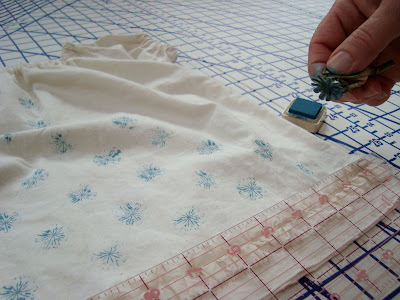 I found that using VersaCraft fabric stamp pads were an easy way to print onto muslin and linen. 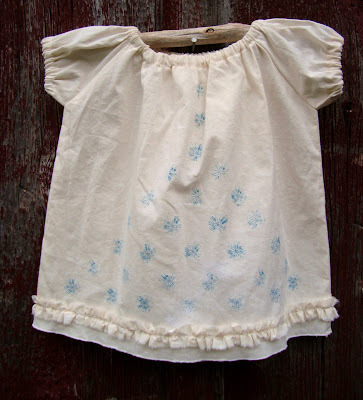 I've been making up some muslin prototypes for my daughter's clothing and grabbed one to embellish. The result was quite sweet in just the way I'd hoped. For both projects, I used a grid and my clear ruler to have some sort of gauge for a pattern... but then I ended up mostly eyeballing it. Very typical Maya behavior: a combination of perfectionism and winging it. Look closely at the different print that this poppy left. Much more floral. If you tried pod printing and enjoyed it, I think you'd love printing on a swatch of fabric. It's such a direct way to incorporate nature into your creating. 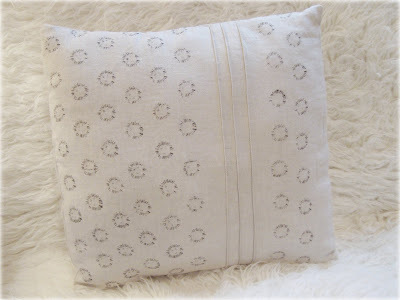 the fabric/pillow is beautiful - from a distance it looks like eyelet fabric! we have nephews in town, and I think fabric printing will be on the list of projects for this week! These looks just gorgeous - what a beautiful way to use nature in your creating! I love your poppy prints! What a great way to use the motif. How lovely! I must try printing on fabric! Oh Maya...I LOVE your poppy pillow!!!!!! 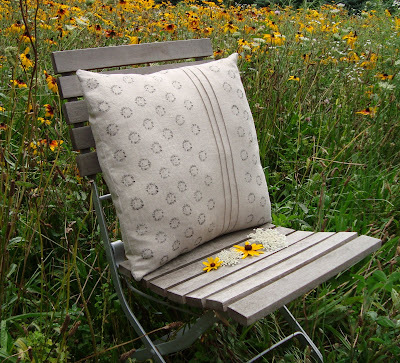 especially against the bistro chair in the garden..its perfect! I just want to go and sit on that chair, lean on the beautiful pillow, sip a glass of iced tea and relax. Oh that pillow is so lovely...fresh and simple. I love it. been looking for for ever!!! Your pillow (we call them cushions) looks gorgeous! I love the subtlety of the print. lovely! and the stamping is great - my little girl used flowers to stamp a painting she did in school last year and the results were beautiful. Now you've inspired me - I've been looking at a funny, old, wonky cane lamp that I thrifted from hard rubbish on the weekend, wondering what to do with it. Now I know! I'll just have to find a flower. Eeeeee! (That's me squeaking over here. My family just might commit me if I'm not careful). Your stamping is just perfect. I can't wait until my daughter wakes up from her nap to show her! i see an entire line of maya*made textiles and textile designs in your future. I adore that pillow, print and pencil pleats. It is a perfect combination. I appreciate that you are involving nature in this process! The result is beautiful! thanks everyone! you're all so loving! Rane- I love this style blouse, too. I'm in the process of refining my own pattern, taking favorite aspects of several loved tops and combining them: needing some fall clothes. How sweet is the little poppy who will continue on long into winter. Love this Maya. This is to thank you for the idea. I and a friend tried printing with poppies (and other things from the garden) this week-end. I like how it came out, thanks again!